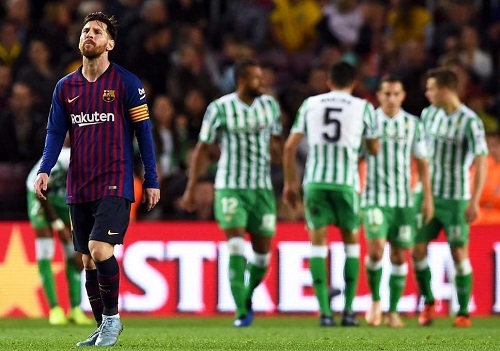 FC Barcelona suffered their first league loss at the Camp Nou for the first time since September 2016 after falling to Real Betis 4-3 today. Real Betis raced to a two goal lead in the first half courtesy of goals from Junior and Joaquin. After the restart, Messi pulled one back from the penalty spot in the 67th minute and gave the Blaugrana some momentum. That momentum would last for a few minute before Lo Celso would score on a shot in the 79th minute that Marc-Andre ter Stegen should have stopped, but the ball instead slipped through his hands. Substitute Arturo Vidal scored four minutes later to make it 3-2. Moments later, Ivan Rakitic was sent off for a second booking and Betis made the most of their extra man advantage soon after when substitute Sergio Canales scored for the visitors to make it 4-2. Messi scored in stoppage time, that VAR ruled was valid, to make it 4-3 but there was not enough time to salvage a tie. Barça remain league leaders as they head into the international break with a one point lead over Sevilla, Atlético Madrid and Alaves. They will be back in action on November 24 when they travel to Madrid to face Atlético Madrid. FC Barcelona: Ter Stegen, Sergi Roberto, Piqué, Lenglet, Jordi Alba, Busquets (Aleñá, 69), Rakitic, Arthur (Arturo Vidal, 45′), Messi, Luis Suárez & Malcom (Munir, 56′). Real Betis: Pau López, Tello, Mandi, Bartra, Sidnei, Junior, Lo Celso (Inui, 85′), Wiilliam Carvalho, Guardado, Joaquín (Canales, 60′) & Loren (Sergio León, 75′). Cautions: Rakitic (43′ & 81′), Arturo Vidal (73′) / Guardado (28′), Tello (67′), Mandi (68′). Previous PostBarça remain unbeaten in Europe with 1-1 draw against Inter.